The aim of Irish Heart’s Happy Heart at Work programme is to assist any workplace to plan, implement and maintain a healthy lifestyle programme for employees. 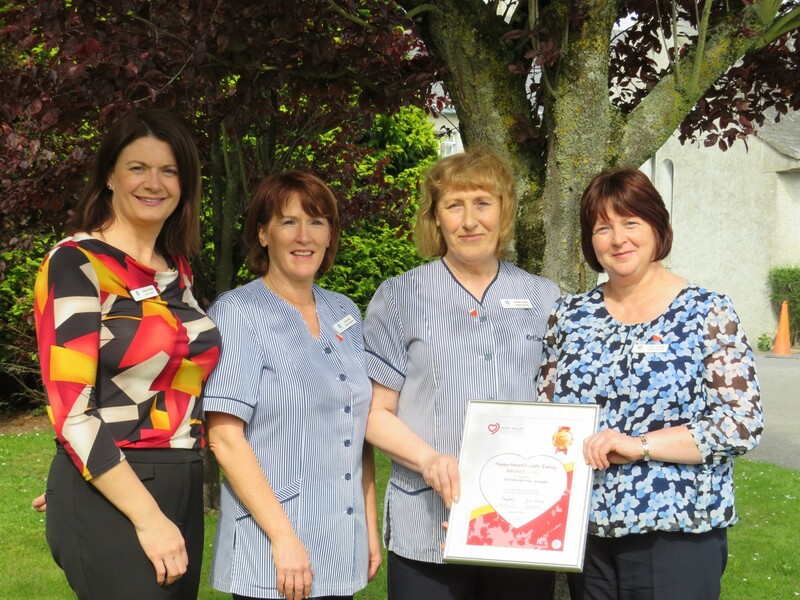 Irish Heart has introduced an innovative graded system to its long-standing Happy Heart at Work Healthy Eating Award for staff restaurants. Heart disease and stroke is still the leading cause of death in Ireland and about 1,000 people die before age 65. Apart from the personal tragedy caused by this ill-health and premature deaths, there are also massive financial costs to industry. There’s an overall loss of skilled and experienced employees. Working days are lost, so too is morale. Ongoing research and experiences in many other countries show that lifestyle changes for many people can reduce the risk or delay the onset of heart related diseases. An independent catering audit was undertaken by an Irish Heart dietitian on 11th May 2017. This involved an independent assessment of overall food choice, counter layout, food preparation practices and menus. It looked at recommendations to reduce fat, sugar and salt and to increase fibre, fruit and vegetables and assesses portion sizes. Employee comments were collected through informal lunchtime conversations. Following a successful recertification visit, Aut Even Hospital was awarded the Bronze Healthy Eating Award. Each award is valid for two years. Ultimately it is hoped that here at Aut Even Hospital we will aim for the Gold award over time. This is the 5th time that Aut Even Hospital has achieved the Award. Janis Morrissey, Health Promotion Manager from Irish Heart said that the award recognised the commitment and hard work from Aut Even Hospital in ensuring the food menus in the staff restaurant meet the recommended guidelines. Aut Even Healthy Eating Award team is invited to celebrate their achievement at an annual Irish Heart awards ceremony later in the year.